Last weekend was my nephew’s 1st birthday and I wanted to make some healthy and fun party snacks. Of course they are gluten-free and vegan, and even my mom thought they tasted like tuna. I never really know about such things since I haven’t had tuna in almost 20 years, but I was happy they were a crowd pleaser. They were super easy to make as well! other herbs to try: dill, celery seed, chipotle, oregano… whatever inspires you!!! Pulse garlic and onion in food processor until finely chopped. Then pour off the water you soaked the seeds in and add them to the food processor with the lemon juice and pulse until you get the consistency you want (you may even want to add a little water if you are looking for a creamier consistency). I made mine chunky so the appearance was more tuna-like. Transfer contents into a mixing bowl and add the chopped celery, parsley, salt, pepper and any other herbs you’d like. One tip to making it even more fishy is adding some seaweed… a sheet of nori works really great. Then I added a small dollop on square cut pieces of romaine lettuce… you can use chard, collard greens, seaweed as a healthy and beautiful way to serve these. 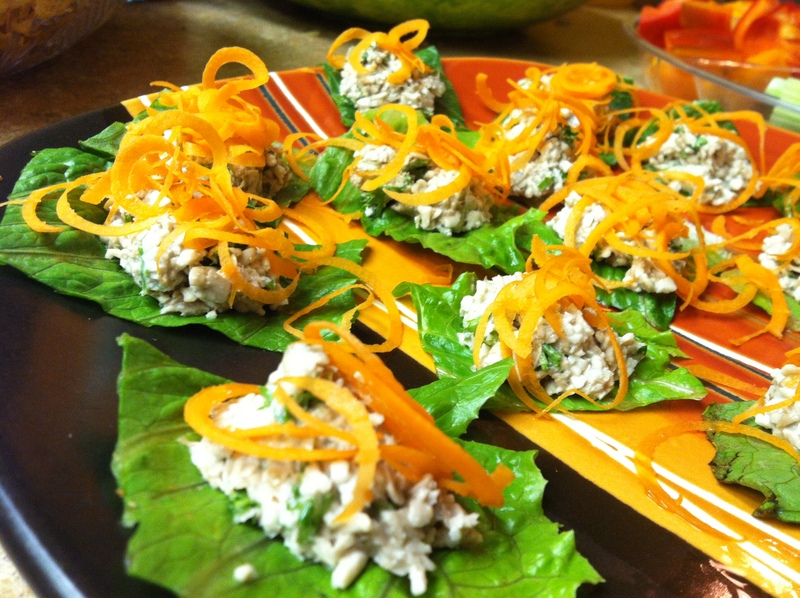 Top with some spiralized or shredded carrot and ENJOY!!! ← Who Needs Coffee When You Have GREEN SMOOTHIES!! !